Proper tool storage is essential for both the organization and the protection of the tools we use for our projects and repairs. As we are constantly acquiring new tools, we are always on the lookout for good tool box deals. We have had enough experience with tool boxes and tool chests to know what to look for when we go shopping for one on Craigslist. 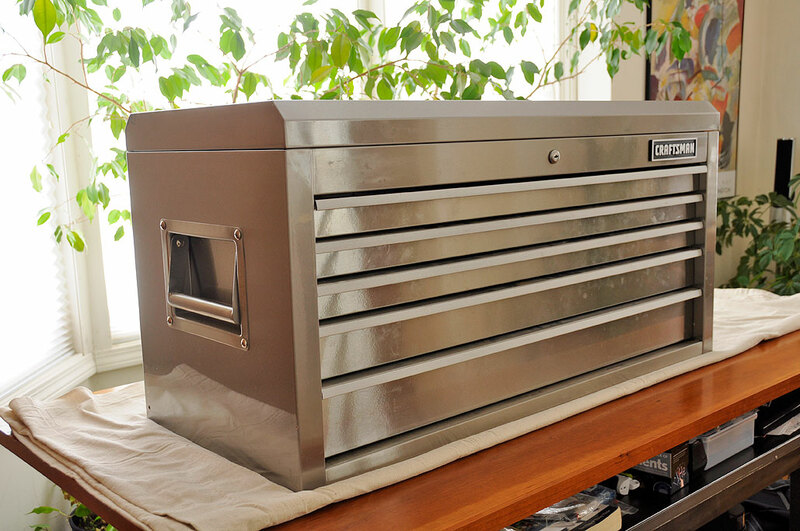 A few weeks ago, we came upon a listing for a “like new” 41″ Stainless Steel top chestat a price which we just could not pass up. After a bit of haggling, we came to an agreement and are now the owner of a tool box from Craftsman’s heavy-duty GripLatch series. 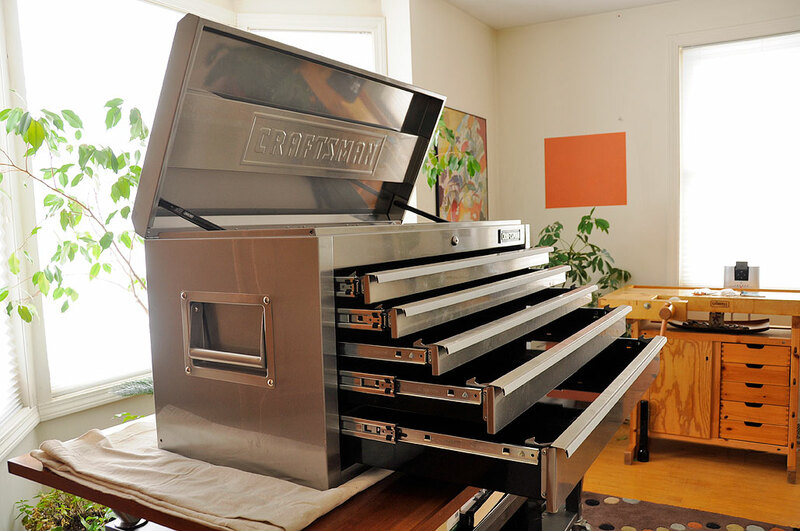 The last Craftsman tool chest we acquired was the Rolling Project Center from their QuietGlide line. Having both in house enabled us to compare them side by side. The differences between the GripLatch series and their lower-end QuietGlide line are significant in several areas. The most obvious difference is the drawer catch. Note the hooks at the corner of the drawers. 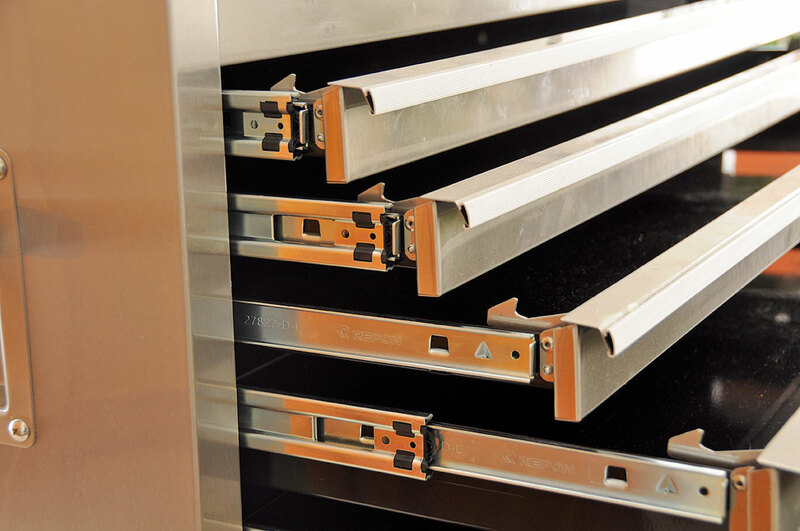 Lifting the handle will release the catch, allowing the drawer to slide forward. This catch, hence the name GripLatch, prevents the drawer from sliding open accidentally. The other major difference is the drawer glide. The glides on the GripLatch series are full-extension ball bearing ones. The ones on the QuietGlide series use nylon wheels. The use of ball bearing glides means the drawers can support more weight (70 lbs vs 50 lb/drawer) and will be easier to open/close when loaded up with tools.